In a filing with the Securities and Exchange Commission, Berkshire Hathaway Inc. BRK.B revealed the ownership of 22.2 million stocks in Phillips 66 PSX as of Aug 31. Notably, the company of Warren Buffett has divested 12.5 million shares of Phillips 66 since June-end. Berkshire is presently the fourth-largest shareholder in the diversified energy firm with 4.8% ownership. In fact, its previous stake of 7.5% made it the top stakeholder in the refining company. Berkshire earlier held 74.6 million shares, resulting in 14.9% ownership of the refining player at the end of December last year. However, Berkshire didn’t disclose the reason behind the recent stake divestment but has announced its plan to hold Phillips 66 stock for the long haul. It is widely thought that Berkshire is booking some profit as the refining firm has been performing well persistently. 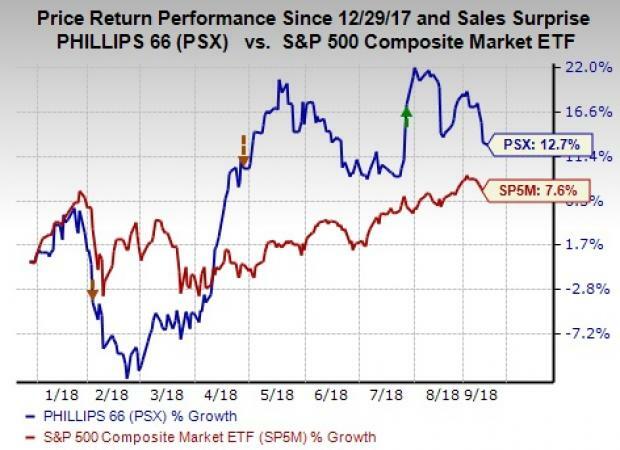 Year to date, shares of Phillips 66 have rallied 12.7%, outperforming S&P 500’s gain of 7.6%. Low input cost due to pipeline bottleneck problems and plentiful domestic oil production has been aiding the refiner to run its refinery plants more efficiently. The dearth of pipeline capacity is prompting operators in the Permian Basin to sell stranded oil at a big discount. Consequently, the input cost for Phillips 66 is declining despite significant recovery in overall crude prices. Decreased input costs, reflected in favorable market crack spreads, aided the refining firm to reap massive benefits through the April-to-June quarter of 2018. Phillips 66’s refining margins were recorded at $12.28 per barrel, jumping from $8.44 in the year-ago quarter. This impressive refining margin can be attributable to the company’s strongest quarterly earnings per share (EPS) since third-quarter 2015. Presently, Phillips 66 carries a Zacks Rank #2 (Buy). Some other top-ranked players in the energy space are Petroleo Brasileiro S.A. or Petrobras PBR and Helix Energy Solutions Group, Inc. HLX, both sporting a Zacks Rank #1 (Strong Buy). You can see the complete list of today’s Zacks #1 Rank stocks here. Petrobras’ bottom-line beat the Zacks Consensus Estimate in three of the trailing four quarters, recording an average positive surprise of 10.4%. Helix Energy’s bottom-line exceeded the consensus mark in three of the last four quarters with an average earnings surprise of 66.7%.